From Wednesday through Saturday at the Reading Terminal Market, some very magical things can be obtained at Beiler's Bakery, one of the Amish vendors at the market. At this fairyland of carbohydrate and butter, one can obtain sticky buns, cookies, shoofly pie, cakes, breads, whoopie pies, and more. 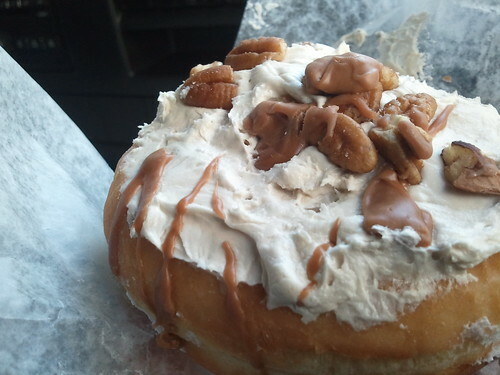 But the most recent sweet treat I knew and loved by Beiler's was the Maple Pecan Doughnut. Because I realize you probably don't have one in your mouth right this instant, let me tell you about eating it. 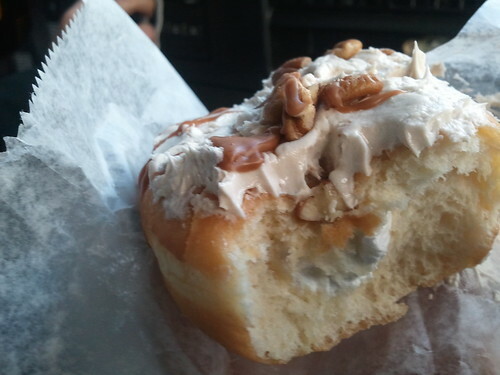 First off, it has a sweet maple frosting on top, which is dotted with toasty pecans with a maple drizzle. It makes for a sweet, candied pecan type of taste. Then, inside of the doughnut, there's a generous amount of sweet cream filling, which acts as a very nice complement to the maple on top. To temper the excessive sweetness, the yeast doughnut itself is not extremely sweet, acting as a carbohydratey jacket for all that sugary, creamy goodness. This is an extremely enjoyable doughnut to eat; personally, I have found that filled doughnuts are the way to go at this stall, as they are baked off premises and the filling keeps the doughnuts moist, whereas non-filled doughnuts can tend toward slightly dry. Beiler's Bakery, Reading Terminal Market; online here.